American filmmaker Darren Aronofsky was responsible for one of my favourite films of the year back in the 2010 when Black Swan came out of nowhere to completely blow me away. Four years on and Aronofsky’s next feature film is an ambitious take on one of the most widely recognised stories known to man, the tale of Noah and the great flood. Conscious of the fact that the legend is prevalent, in one form or another, in a number of different religious and mythological texts besides the Bible, Aronofsky chooses to guide his narrative under the pretence that a great, unnamed ‘creator’ is responsible for the symbolic visions Noah receives, thus freeing himself of the burden of having to perfectly replicate any one version of the tale. So would Noah be a fresh and innovative take on a thousands year old story of a flood to end all corruption and vice in the world, or simply another plodding, mundane regurgitated Biblical epic? The truthful answer is that it is a little bit of both resulting in not much of anything, presented instead by it’s writer/producer/director as an altogether bizarre fantasy adventure akin to The Hobbit or The Lord Of The Rings. Aronofsky has constructed a narrative that relies heavily on the use of magic and fantastical elements that surpass even those of the Biblical source material. A significant early portion of the film’s narrative is dedicated to creatures known as Watchers who guard the mountain upon which Methuselah, Noah’s grandfather, lives. These Watchers are explained to be fallen angels now encased in stone for disobeying the Creator’s wishes, and one would be forgiven for thinking that witnessing Noah (Russell Crowe) converse with these stone giants was a scene from Clash Of The Titans mistakenly included. And the 1981 version of Clash Of The Titans at that, as the CGI animation used in the making of these Watchers is of an extremely questionable quality, a really rather odd criticism given the copious flooding sequences are perfectly acceptable. Other mystical and slightly mad additions to the legend include a magically glowing snakeskin that is wrapped around one’s arm to mark their coming of age, and these invented touches from the filmmakers, along with the refusal to acknowledge ‘God’, serve to almost completely remove the overtly religious aspects of the narrative and refocus the story in an unrecognisable universe similar to that of Middle Earth or George R.R. Martin’s Westeros. All of this extraneous fantasy proves detrimental to the core themes of the film that are given room to breathe once the supernatural pre-flood hysterics are mostly over and Noah and his family are left to dwell on their strangely square shaped ark. It is this second half of the film that I found to be more entertaining and engaging, witnessing the moral dilemma that Noah faces with regards to the repopulation of the Earth and the limits he is willing to go to in order to fulfil what he believes is the Creator’s will. One excellent decision on Aronofsky’s part was to contain the messages from the Creator to within Noah’s own head, posing the interesting possibility of whether Noah might actually be a disturbed zealot rather than a true chosen one, and we see these very questions explored within the dramatic confines of his family in the more sedate and enjoyable parts of the film. As for the cast, Russell Crowe as Noah is fine if not a touch hammy at times, it is almost as if he is playing Gladiator’s Maximus Decimus Meridius without any of the charisma and charm. The role demands a lot of stomping about and shouting, and Crowe delivers on these requirements with no problems even if the performance as a whole is rather unforgettable. The same can be said for both Logan Lerman and Douglas Booth who play Noah’s sons Ham and Shem, giving satisfactory yet unremarkable turns. Deserving of slightly more praise are Emma Watson as Ila, a taken in orphan, and Jennifer Connelly as wife Naameh. Portraying the one woman left with the responsibility of repopulating the world, Watson carries the weight the role well and displays some serious dramatic technique in some of the more emotional scenes involving her character. Jennifer Connelly brings a much needed sense of calm to the proceedings and at times almost acts as the audience’s representative within the narrative, serving Noah with much needed reality checks at the height of his questionably zealous behaviour. Cameos from Anthony Hopkins and Ray Winstone, though the former is much more enjoyable than the latter, make very little impact on the audience in a film that, if one is being honest, cares much more for it’s metaphorical content than it’s supporting characters. 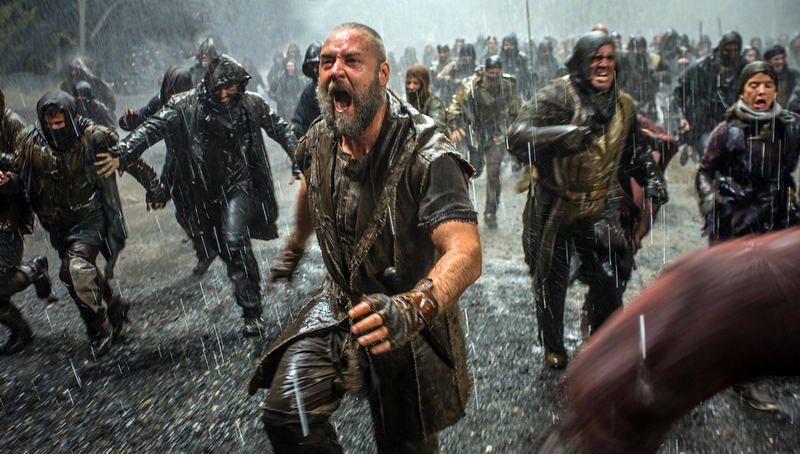 Overall, Noah is a strange kind of film, one that I cannot imagine is religiously faithful enough to amass a devout crowd, or commercially appealing enough to gain a large mainstream following. Darren Aronofsky should be lauded for his grand ambition in telling and taking artistic licence with a story so old and so well known, but ultimately I feel that the gamble did not pay off, leaving the finished product nothing but a messy, genre confused fantasy adventure that, whilst possessing some engaging dramatic content and wider messages about environmentalism and the human condition, is not worth the patience it takes to get there. So far, I’ve loved every single film by Darren Aronofsky. But ever since the news came out that he’s working on a biblical tale… I’ve been very skeptical about his latest & the bad reviews are only a reflection of what I feared. Precisely what I expected! Thanks, as always, for an honest review. 1) “Creative retelling”: The story of Noah, as told in the book of Genesis, is a creative retelling of several flood myths from the literature of Mesopotamia. In making the alterations the author did, the author of the Noadic tale seems to have wished to communicate something of the god in which he believed and not literal history. Added to that is the fact that this movie preserves literally EVERY important moment of the biblical tale and, therefore, is a more faithful telling to its source, than the author of the Noadic tale was to his. 2) “Midrash”: Basically, this is a type of Jewish interpretation which, in enfleshing a narrative, attempts to draw persons into new considerations of a not-so-new tale. What you see with the Rock People (which I thought were kinda dumb), and what you see with the inner torment of Noah and his feeling as if God was calling him to kill the child[ren], are examples of enfleshing a narrative for the purposes of introducing new considerations. I think, overall, Aronofsky did okay here. While I was not crazy about this film – I normally like Aronofsky – I find that the religious objections to this film are not worthy of respect. I’m noticing now that this post was written in April. That makes this comment a rather late one.